Model T Ford Forum: Silicone Spray for Mounting Tires? Silicone Spray for Mounting Tires? Model T Ford Forum: Forum 2014: Silicone Spray for Mounting Tires? I have an old but very barely used set of New Zealand Firestone 3 x 3 1/2 tires to mount on a set of silver powdercoated demountable rims. Several different lubricants have been suggested to aid the tough old rubber over the edge of the rims but I had a brainstorm (always dangerous) the other night while conversing with a non-Model T crony. This time last year I was working on an old 1939 Cadillac Coupé. It was getting a new Pertronix 6v ignition, cap, rotor, plugs & wires. The wire & boots were from Restoration Supply and look era correct. The problem was that the boots were too tight to move on the wire. I tried every lubricant on the shelf and nothing helped. I paid a call on an old time mechanic who does the work on my modern car. He suggested silicone spray which he used to use back when cars still used still used these ignition harnesses. Modern cars must use something else now . . . I tried the silicone spray and it worked right away. I suggested using this spray on the tires to my pal and he predicted all sorts of disaster, the silicone would attack the rubber, my hair would far out, "Danger Will Robinson!" Would it really? Some years ago silicone spray was sold as a rubber preservative. Why wouldn't it work here? Has anyone tried it? I would not use it even if it was a rubber preservative! 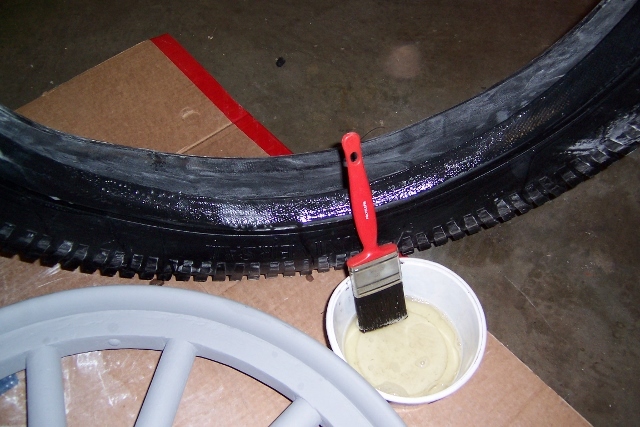 Remember that you are trying to get enough slip to mount the tires but once it is on you want as little slip as possible so the rim does not creep inside the tire and pull the stem out of the tube. Most water based lubes in effect become glue after drying but the silicone will stay slippery forever. I've always used talcum powder. My grandfather was a barber and when he retired, I wound up with a rather large can of it. I know that the tire shops many years ago used talc before they started using liquid soap and water. I must agree with Layden. You definitely do not want slippage of any kind once the tires are on the rims. Your valve stems will thank you for it. I use RuGlyde. My gallon jug has lasted many years. My dad used it when mounting tires in his service station years ago . You want that clincher tire to be mounted fast to that rim and not move. Others have claimed to use hand cleaner gel (GoJoe) but for me the only tried and true way is a bit of dishwasher soap and water. Prefer the Joy brand, has nice scent that goes will with the baby powder talc used with the tube and inside the casing! OK, it sounds like my pal was right about that. I better not tell him or there wont be room in the car for his head . . . I have used Murphy's oil soap. Slicker then snot on a door knob and will not harm the rubber or stay slippery once it dries. I have used it on heavy equipment tires, tractor tires, and lawn mower tires. Easy clean up too. I have used talc for years, never a problem and is a dry lubricant. Obviously this calls for a 50/50 mixture of modified bitumen roofing tar, WD-40, and Marvel Mystery Oil. Actually, I'm a somewhat "overwhelmed" at the thought of a "50/50 mixture" of three different ingredients! It's the best stuff you could possibly use! 150% effective! Seven of the top five tire mounters recommend it! The reason we put over 50 psi air in the clincher tires is to get them tight on the rim. If they slip it could pinch off the valve stem and/or cause the tire to come off the rim. I personally would not like to use my car for a guinea pig to see if the silicone spray works. It sounds like a good idea for installation, but not so sure it would be good for keeping things in place. Well, bugger me! All those tyre fitters in all those tyre shops have been doing it with the wrong lubricant all these years. Someone should tell them what the correct stuff to use is. No wonder they gave me some to use!!!! Good call Steve! We haven't heard about the modified bitumen roofing tar for about a year. I use rug glide. Some of the skins installed were probably thirty year old Wards. Really cant see how Model T HP can slip a clincher rim tire with 60lb of air. Herm sent me a video of a guy using a black garbage bag stretched over the clincher. The tire was new and no tire irons were used for installation. It took about five minuets to install--I deleted the video. It is the new math! I think that means it works real great! I'm 110% behind you on this one!!! I'm thankful that Joe Bell has the arm strength to do it for me! I tried and just can't get 'em on the rim. He did 'em dry! I've have had good success with RuGlyde. I mounted a set of those. I slid them on a plastic barrel then pored very hot water on then as I pounded them down around it before I mounted them. They are small at the inside diameter and not easy to mount. That way they were pre stretched. They were still hard to mount but not like without stretching. Have fun! I use a Plastic bag. I mount both sides at once. bag on the wheel. Put the tire on the wheel. and work the tire on with tire irons. When the tire is on, cut the plastic off with a sharp cutter blade. It only takes about 10 to 15 minutes to mount a tire. I am also a fan of RuGlyde - I have mounted approximately a dozen sets of clinchers or more. That whole black bag "presto-magic" thing did nothing but cause me grief trying to get all the chunks of plastic out from under the rim ! Use a thin garbage bag laid on the backside of the wheel. Make sure it's double thickness,and covers the whole wheel. The plastic will slide against itself and not against the tire or rim. after mounting the tire, tear out the bag in pieces. I have a hole in my bench that the hub goes thru, allowing the rim to lay flat on a couple of old floor mats. My paint for wheels is Rust Oleum Professional spray can, one per fully assembled slow turning wheel. I leave my tires in the hot summer sun for an hour or so, then use the plastic bag method. So easy for me it is almost scary. I agree with Peter and Leonard about using plastic bags. It took me only a few minutes to remount a 45 year old tire with the bag technique after unsuccessfully spending 2 days with soap, and powder. I've never used the plastic bag trick but will next time. However, when removing or installing tires with a tire iron I have several patches of leather about 2" by 4" that I put under the iron on the rim. It helps to avoid chipping the paint from the tire iron and is easily moved from on place to another. As Leonard said the movie I seen a double layer was used the bag was whole over the rim. It will take a little practice but for me its one job I have wanted to make easier. Never seen any clincher tire mounting this easy. I don't know how to post the link but you can search clincher tire mount with a garbage bag and it comes up. It took five minuets with a new tire and no tire irons. One more way. I'm posting this for an old buddy of mine who passed away about 15 years ago, Ralph Hartman. Saturday will be tire wrangling day. I have the four Firestones to mount and a Commander for a spare along with all new tubes, flaps & hardware. It is supposed to be coolish, mid 60s but I'll get the tires out in the sun early to get them as warm as possible. The talc & soap are ready along with the trash bags. We'll see what happens! In my industry we use a lubricant for pulling cables through conduits. It is known by a number of different names but 'slippery lube' is what I call it. It is non toxic, etc and dries out eventually so does not cause the tyre to slip around the rim after it is mounted. I brush a little on the rim and the bead of the tyre and lever both beads over the rim. I like to do this with the wheel on the car, Royce Peterson style as it lets you get a good grip on everything. Sometimes I will drop the jack down and let the weight of the car just hold the bottom of the tyre on the ground with both beads in and then work my way up. I try to leave the tyres out in the sun to warm up as well. Amazing how much easier they go when they are warm and a bit more flexible. Lots of different methods and you will find what works for you. Next time I am fitting tyres I might film it so I can show others how I do it. It is always a popular topic with lots of different styles. Have fun. Also like to use minimum 60 PSI when they are on.